This article first appeared in Coda, issue 278, March/April 1998 and it appears in EFIP in full text form through the courtesy of Jon Morgan, and Bill Smith of Coda. The late British drummer/bandleader John Stevens had a keen eye for talent. 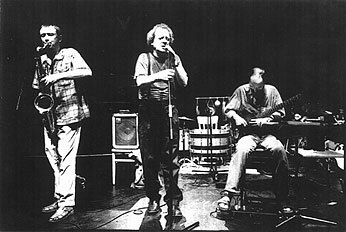 In 1992, Stevens, whose Spontaneous Music Ensemble had, through the years, enlisted the talents of saxophonists Evan Parker and Trevor Watts, guitarist Derek Bailey, bassist/cellist Kent Carter, to name but a few, was seeking a replacement for violinist Nigel Coombes. After attending one of John Butcher's performances, it became immediately apparent to Stevens that this soprano/tenor saxophonist was ideal. For Stevens, Butcher was a natural selection. His music resembled Steven's pioneering SME, which took conscious measures to establish a distance between their art and that of the jazz tradition. Instead they placed emphasis on the individuals' roles as players, both as soloists and in ensembles, as well as examining the instrument's capabilities outside the lineage of established techniques. Furthermore, Steven's unabashedly dynamic personality ensured that Butcher's venture would be worthwhile. "I think John was phenomenal at bringing together two often incompatible things," Butcher recalls. "He could generate terrific propulsion and momentum, and at the same time, leave space, both literally and conceptually, for the music to be an interactive, group activity, where the players didn't have to adopt roles." Initially, the Butcher edition of the SME performed as a quartet with guitarist Roger Smith and flautist Neil Metcalfe. However, the last handful of concerts were done as a trio of Stevens, Butcher and Smith, as documented on A new distance. Even though performances for the SME were infrequent, Butcher learned an important lesson about musician/audience interaction. "In concert he had a manner that forced the audience to concentrate on the smallest details. The circumstances around some of the gigs were not ideal, but when it came to the music, he communicated the feeling that this is what we're doing at this moment, and it's important. At the last SME concert, he'd had some transport problems and only brought his pocket trumpet, no drums. I thought it would be a difficult gig but his sense of the uniqueness of playing music that evening made it magical." By the time Butcher and Stevens met, the 43 year old saxophonist had already developed a unique style which he has used to assert himself as one of the most original saxophone voices of the late 20th century. Not merely content to find a niche within the developments of Evan Parker, Steve Lacy and Anthony Braxton, Butcher has opted to choose his own path. "I'm not a good post modernist," Butcher admits. "My own route into improvising was quite convoluted, but I was very drawn to the idea of trying to start from scratch. Part of this was a way of trying to deal with my musical enthusiasms at a subconscious level and not explicitly refer to them in my own playing. I love a lot of jazz, but for a European of my age it makes no more sense to work with those models explicitly than to try and write songs like John Lennon." Playing both the soprano and the tenor saxophone, Butcher finds that his choice depends largely on the situation. "I think each instrument suggests its own music and approach. I prefer the tenor for more polyphonic playing and for trying to work with different ideas simultaneously. It's also better for working supportively in a group, rather than in the foreground, and has an enormous range of dynamics and attack. The soprano is easier to integrate into a group as a voice of its own, but is more prone to cliches. It has a superficial agility which I need to guard against. In solo concerts I often actually find the soprano more challenging, because you have to invent something as an alternative to the richness of the tenor." Butcher's discovery of his own voice on his instruments can be attributed to being largely self taught. While attending summer jazz schools; first as a piano player, the second time as a saxophonist, Butcher was mostly interested in chord changes. He was also attending many British jazz concerts and slowly being introduced to improvised music. However, it would be several years before Butcher would succumb to the seduction of "new music." "I think the 70's in London was a good time musically, with many of the exiled South Africans playing (such as Louis Moholo, Johnny Dyani and Chris McGregor), and people like John Surman and Tony Oxley around. Also, you could go to what was ostensibly a jazz concert and find Derek Bailey somewhere on the bill. This was how I first came across the English improvisation scene, which I didn't really follow then, but it nagged away at the back of my mind for a few years. My involvement with jazz was really a learning activity. I felt both jazz and composition had largely run their course, and improvisation was clearly where people were creating something new." After several years of conventional saxophone playing, Butcher found himself seeking a more existential role, consciously avoiding solo statements, playing underneath other instruments, and in general, trying to alter the role in which the saxophone was traditionally limited. "In leaving my student jazz days behind, I tried to improvise by discarding 90% of what the saxophone usually does. I learned a lot looking for replacements. After a few years of this I felt I could bring other material back, but transformed with different connotations. Could I play a melodic line that didn't suggest a particular idiom but wasn't pointlessly abstruse." Butcher explains. 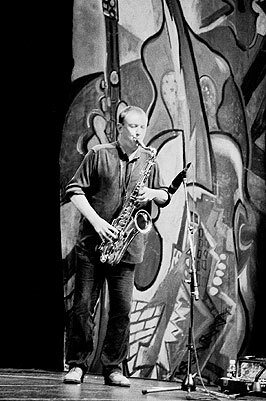 Both of Butcher's solo discs, 1991's Thirteen friendly numbers and 1996's London and Cologne document his solo saxophone developments. While sometimes a risky venture for Butcher, the art of solo performance can be rewarding. "Some of the best bits come when you're playing near the edge of your control and knowledge. On the saxophone there's quite a thin line, physically, between getting a miserable squeak or a fabulous chord. When the music's working, I think it creates its own connections and shapes that are more interesting than ones you might have tried to consciously impose." For Butcher, the real challenge is the fine line that exists between spontaneous creation and preconceived settings. Playing solo insights a mental tug-of-war between playing what he already knows and instant composing. "This ties in with what I think solo improvisation should avoid, that is, being a sequence of routines or a presentation of techniques. If you're interested in using new instrumental sounds there's a danger of just playing a rather decadent set of aural treats. Much of the adventure in European improvisation has come from players advancing through the feedback between their musical and instrumental imaginations. However, I don't want to draw the listener's attention to the mechanics of what is going on and, because I'm so intimate with my own musical material, I have a tendency to move away from what I know will easily work. Like most musicians, I presume, I practice to try and achieve complete control of what I want from the instrument. This is so I can then hopefully release that part of my thinking in performance and just worry about the music. In a sense the performance is 90 percent preconceived except for the actual music." On the two solo discs, Butcher delves into the process of overdubbing and multi-tracking. Originally stemming from an aversion to saxophone quartets, Butcher's initial explorations involved the sonorities of one player recorded multiple times, significantly different compared to the embouchures and oral cavities of four different players. "Since then the works had two main strands, using synthesis, like the first part of "Bells and Clappers" on Thirteen Friendly Numbers, and amplifying and revising an improvisation each time you add a new part, like "Two Up, Two Down," also from Thirteen Friendly Numbers. Recently I've been using multi-tracked pieces on tape to improvise to in performance. The problems here are leaving enough out of the tape to make a live voice feel necessary, and how do you deal with one partner not interacting." Due to its preconceived nature, such an approach lands Butcher in between composition and improvisation. However, the saxophonist seems uninterested in such distinctions. "Many Improvisers are in fact such strong stylists that their music overlaps what's normally expected from composition." In a group context, Butcher is a much sought after partner, equally adept at listening and knowing when to adapt. "How player's relate, ideally, works on many levels at once; or at least varies moment by moment. The important thing, for me, is to let your decisions/reactions come out of listening. I think group improvisation should force the individual players beyond their own conceptions. I value pieces that couldn't really have been imagined by any particular player. I tend to like the kind of group interaction where any one of the players could, if they wanted to, change the direction of the music at any instant and it would still make sense." As an alternative to performing with one standard group, Butcher is part of many projects, periodically playing with several cooperative aggregations. "You can sometimes actually experiment and push things more in a long-term group. I rather like regular groups that don't perform very often. There's a lot of shared experience, but methods haven't become formalized." His trio, with violinist Phil Durrant and guitarist John Russell, with whom he started Acta records in 1987 to release their Conceits recording, has been loosely working together for thirteen years, yet the playing still proves stimulating. "I'm still fascinated by trying to work with two acoustic string players, and ostensibly melody instruments. The saxophone can feel very primitive in such company," Butcher explains. while Mouthful of ecstasy finds the saxophonist as part of the Phil Minton quartet with pianist Veryan Weston and percussionist Roger Turner. "I especially like working with the voice, Vanessa Mackness brings a very direct emotion to the music, and connotations that aren't touched on in instrumental improvisation. For some people it sounds too personal. Of course, Phil Minton is "the" vocal innovator and any group with him is a pleasure." Other collaborations include the octet Ensemble, with pianist Chris Burn. "Ensemble (see Cultural baggage and Navigations) tries to address some of the ever-present problems of large group improvisation, like the more players, the more every piece sounds the same." News from the shed adds percussionist Paul Lovens and trombonist Radu Malfatti (with whom Butcher has appeared on Malfatti's Ohrkiste) to the trio of Durrant and Russell. Frisque Concordance, a quartet with bassist Hans Schneider, pianist Georg Gräwe and drummer Martin Blume is heard on Spellings. Also, a document of Butcher's trio with Bailey and percussionist Orren Marshall is in the works, keeping Butcher's musical itinerary full. Nevertheless, Butcher welcomes the opportunity to play with new players. "You have to allow for, in my terms a probably increased failure rate, but improvisation isn't about presentation of product." Butcher will be touring North America this summer, playing in various collaborations and impromptu groupings with Grawe, bassist Barry Guy, percussionist Raymond Strid, reed players Mats Gustafsson and Luc Houtkamp, and percussionist Gert Jans Prins during Vancouver's jazz festival, percussionist Gino Robair in San Francisco, cellist Matt Turner in Milwaukee and with cellist Fred Lonberg-Holm, trombonist/guitarist Jeb Bishop and violinist Terri Kapsalis in Chicago. 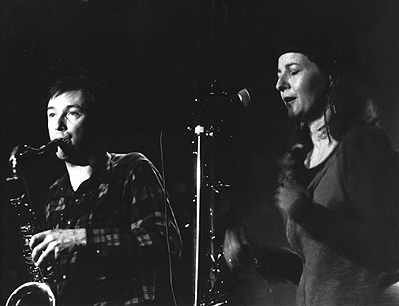 Continuous opportunities to play with new players, in unique settings, probably accounts for Butcher's optimism regarding the creative improvised music scene. "I think that some musicians have shown that if their discoveries in "free" playing go deep enough, there's a whole lifetime of music to make. The challenge is not to dilute the original motivation in the face of lack of money, media indifference and vagaries of fashion." As an artist, Butcher is not discouraged by occasional setbacks, still approaching the music one development at a time, learning something new at every step, without compromise. "I like the idea of trying to do everything you want on one instrument. I think having to struggle communicates and throws up things you can't foresee. And not just instrumentally, I'm drawn to the sensual and emotional qualities of music but want to avoid the cliches they so often come with. Part of me likes to start a piece and not know what it's going to sound like and part of me wants complete control. In general, I hope not to recover too much old ground and to avoid quick solutions." A prospect that holds much promise for enthusiasts of creative improvised music, indeed.